Grid reference: 487640, 129900, View on: Google Maps, Open Street Map, Streetmap, National Library of Scotland Map or Oldmaps. Appended to the entry for St Peter's Church. 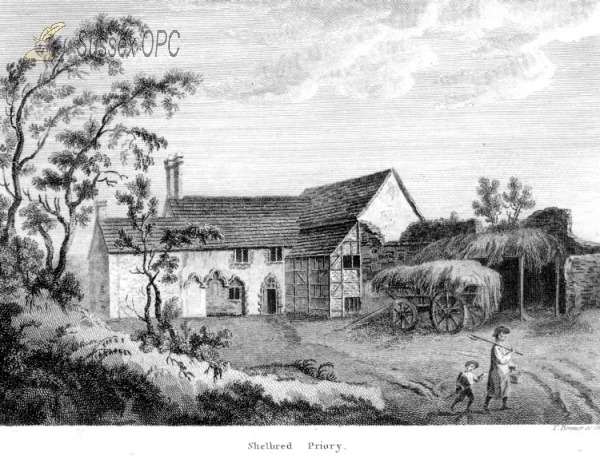 About a mile south are the ruins of Shulbrede Priory, incorporated with a farmhouse. It was founded by Sir Ralph de Anderne for canos of the order of St. Augustine. A large upper hall, called the Prior's Chamber, has some curious mural paintings; the second room is the monks' appartment, and has groined vaulting, springing from E.E. marble columns.